A display maker has added voice control to one of its lines. BenQ has improved its Premium RP Series of interactive flat panels with voice command delivered by Amazon Web Service (AWS). The voice activation takes the place of a physical remote control. "Saffi" — a twist on the Greek name Sophia, for "wise" — is available on three displays currently: the 65-inch RP6501K, 75-inch RP7501K and 86-inch RP8601K. The company said a firmware update enable the same voice capability on RP display units already in customer sites. An in-room air sensor for carbon dioxide monitoring; flicker-free and low blue light transmission to reduce eye strain, and a germ-resistant screen. 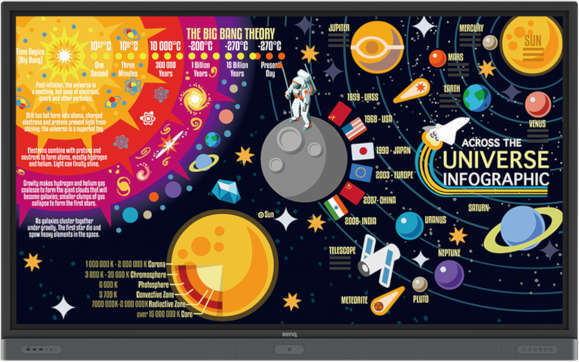 When the displays are combined with BenQ's EZWrite 5.0 platform, the interactive panels allow users to share ideas, notes and sketches that can be captured and annotated from their personal devices, in or out of the room. Those files can be transferred between cloud services, including Google Drive and Dropbox. "When we introduced the RP Series IFPs, our goal was to deliver a new and powerful way for teachers to command the classrooms and to drive learning potential for students," said Bob Wudeck, the company's senior director of education solutions, in a statement. " For over a year, we've been working with AWS to perfect the integration of voice. With our latest update, teachers and students will enjoy a more seamless, flexible and productive experience."